SAN ANGELO, TX — U.S. 67 from San Angelo to Mertzon was blocked Thursday evening due to a fatal crash. 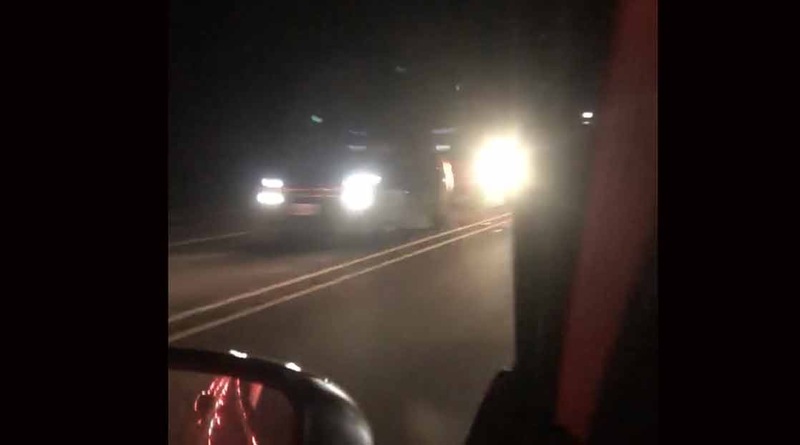 According to the Texas DPS, at 6 p.m. Thursday evening, three vehicles collided approximately 10 miles southwest of San Angelo on U.S. 67. Our reporter estimated the wreck beyond the Boy’s Ranch turnoff and intersection of FM 2335 at Tankersley. There, a 2018 Ford F-350 driven by a male driver was eastbound on U.S. 67 at what DPS determined was a very high rate of speed. The F-350 struck an eastbound 2014 Chevrolet pickup also occupied by a male driver. The Chevy pickup was forced off the left side of the roadway due to the collision. After striking the Chevy pickup, the F-350 driver continued driving eastbound and struck a second vehicle, a 2003 Chevrolet pickup. It too was occupied by a male driver and was forced off the prepared surface to the right side of the roadway due to the force of the impact. After striking both Chevy pickups, the F-350 ended up off the right side of the roadway. Both drivers of the Chevys, who were both the sole occupants of their respective pickups, were transported to Shannon Medical Center. However, the driver of the 2014 Chevy did not make it. He was pronounced dead by Tom Green County Justice of the Peace Eddie Howard at 7 p.m. due to injuries sustained during the crash. DPS did not report on the condition of the F-350 driver or if any charges were filed against him, as the report was a preliminary one. We were unable to reach the crash scene due to the miles long traffic jam southwest bound out of San Angelo. Over the EMS radio frequency, we heard Airmed1 making an approach to what purportedly was the crash scene. The DPS report did not mention the use of the helicopter ambulance. Correction: DPS corrected their original report to indicate JP Eddie Howard was the Justice of the Peace at the fatal crash scene. We updated the story above to reflect that. SAN ANGELO, TX -- Details are sketchy at this time but a three car crash shut down U.S. 67 South between Tankersley and the Irion County line early Thursday evening. Traffic was backed up for miles and drivers sat in line for hours. Scanner reports indicate one person may have been transported to the hospital by helicopter. The traffic was backed up so far reporters were unable to reach the crash site for hours. This is a developing story. We will update this story as official information from the Texas Department of Public Safety or the Tom Green County Sheriff's office becomes available. Can we get more info on this story? Was the guy intoxicated, running from police, running from someone? Did y’all even bother asking DPS what happened. Some information is public record. Rather than make information up, we wait for the investigating agency to release official information. If we have information outside the officials, and we find it credible, we may report that. However, in this case, our reporter was unable to get to the crash scene so we asked the DPS to provide it, and we reported it. These investigations usually take more than 3 hours to complete. If charges are involved it may take weeks. Many people we impacted by this crash, as it closed down the Mertzon highway. Folks were stuck in traffic for hours, including our reporter. Rather than wait until we can write a historical paper on the crash, we provide as much information as we can get. If you'd rather wait until the investigators themselves know what happened, I suggest you skip these stories and await the followup. That way, you won't get anxious, or need to take extra meds. I suspect technology has bred a new generation who knows nothing but instant gratification. Patience, like common sense, seems to be following the path of the Dodo. Because it's so important to bring charges against someone that is dead. I mean...really!? If you would read this article carefully the driver of the F-350 is the one that hit both other vehicles. He is not the one that passed away. It was the driver in the 2014 Chevy . This road is becoming more dangerous. There is a lot of traffic due to the oilfield . People need to put down their phones, pay attention , and slow down. Prayers for everyone involved.